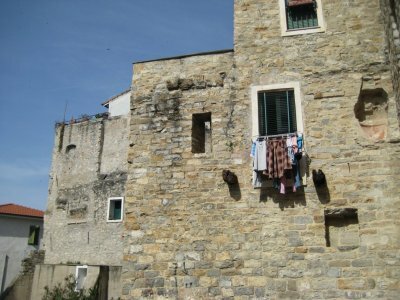 San Remo, Italy offers up the medieval warrens of Pigna hill. View Monaco Grand Prix 2009 on GregW's travel map. 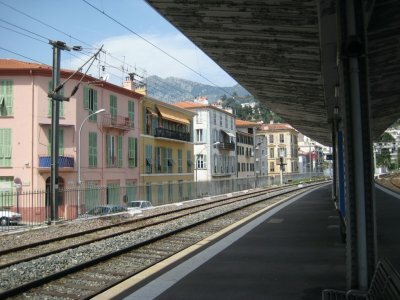 I caught a train in Nice to Menton, where I planned to transfer to my eventual destination, San Remo. Here is the first point in the trip where not researching a trip more bites me on the behind. 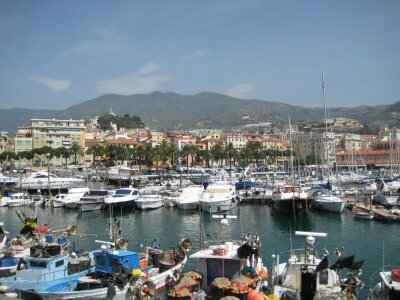 I had read on the internet that you could travel between Nice or Monaco and San Remo by changing trains in Menton. I read this on a unofficial Formula One message board in a message that was 3 years old. So I bought a ticket to Menton, and got off the train. 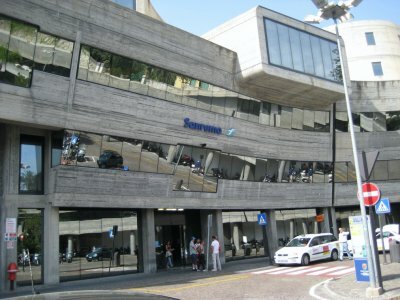 I don’t know if the message was wrong, or in the 3 years since it was posted trains between France and Italy changed their terminus and transfer point, but to get from Nice to San Remo, the place to change trains is in Ventimille. I learned this quickly upon departing at Menton, though not quickly enough to jump back on the train I had just departed that was bound for Ventimille. Instead, I had to wait 20 minutes to catch the next train another 2 stations down the line. While waiting, I took a photo of the pretty station. After a seamless transfer in Ventimille, I arrived in San Remo. 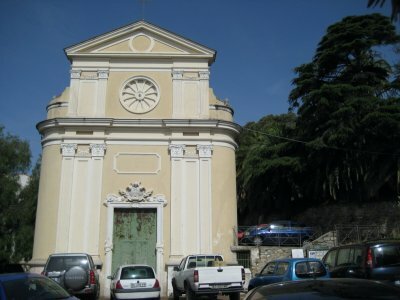 San Remo train station is buried inside a mountain. 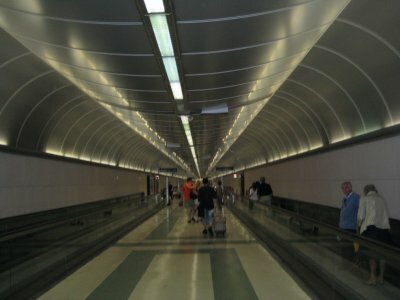 To get from the tracks to the main station, you have to walk through a long tunnel for what feels like a dog’s age. Both being buried so deep underground and with its modern architecture, it feels more like a fall-out shelter or the lair of some master-mind criminal in a James Bond film than a train station. One bit of research I had done before departing for Italy was to use Google Maps to get directions from the San Remo Train Station, even using the “walking” feature to map out the route for me. It was only 2 kilometres, not far to walk. What Google Maps doesn’t do, though, is figure out if the route they are giving you involves going up and down and up and down numerous hills. Sweating profusely from the exertion of work out, I arrived at my hotel. Villa Maria, Mary’s Place. 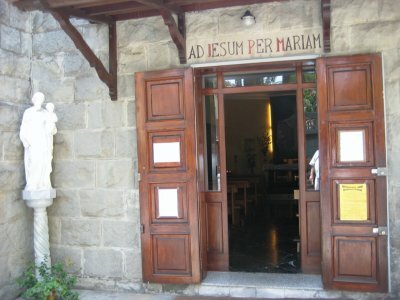 My room had a picture of the Virgin Mary above the bed, and there was a small chapel out near the road at the entrance to the hotel. Welcome to Roman Catholic Italy. 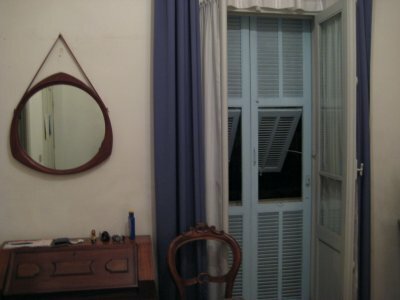 The room was quaint and had a nice rustic feel with its period piece furniture and wooden shutters keeping out the afternoon sun. I took a quick tour around the town, and treated myself to two dinners that evening. 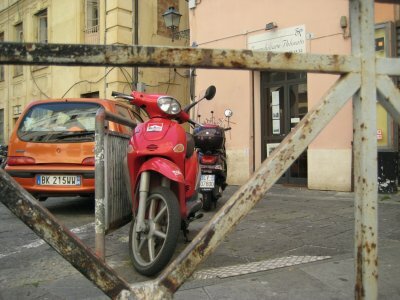 The first, let’s call it the piccolo, consisted of a panini that I grabbed at a small cafe on the Rondo Volta. Its amazing that tomato, mozzarella, mint and oil olive on toast can taste so good, and it made an amazing pick me up for a hot afternoon, refreshing and energizing and not too heavy. The later meal, let’s call that one of the grande, was consumed 4 hours later at 9 PM, a time I consider obscenely late for dinner but which most of Europe seems to consider reasonable. It was a carpocio starter and a perfectly cooked tuna steak on the main drag of town. I retired to bed tired from the night before and a full day walking, expecting to get a decent night sleep. 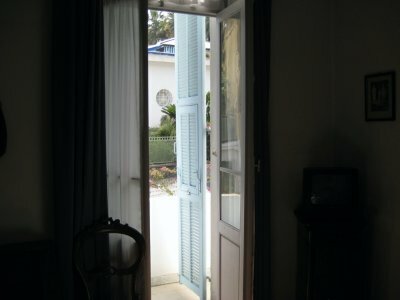 The bed was comfortable and the room the perfect temperature with the cool night breeze coming in through the shutters. It was not to be a peaceful nights sleep, though. My room faced out onto a road. I’ve lived in cities for the past 12 years and had always consider myself to be able to sleep through the noise of traffic. 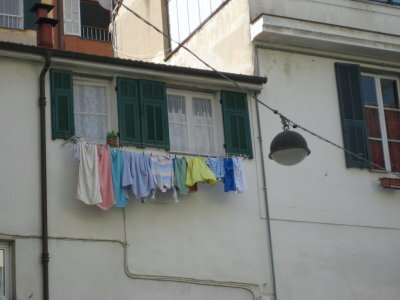 I discovered something that first night in San Remo, though. Apparently I can sleep through traffic noise as long as it is consistent in its volume. The road my room looked out on had a car drive up it every half hour or so, but otherwise was silent as a church. The noise of the car would wake me up because it was such a sudden switch from the previous silence. I would lay awake for a bit before finally drifting off to sleep again 20 minutes later, giving me 10 minutes before the next car came tearing up the road and waking me up again. Once light started to break, then the birds joined in the noise-making. There were screeches, caws, whistles, hoots and something that sounded suspiciously like an elephant trumpeting. The birds kept they calling infrequent and variable enough to keep me awake, and made me long for the constant noise of car traffic outside my London flat. With my previous restless night on the train and 3 nights of disruptive traffic noise to deal with, it appeared that this mini-holiday would not feature much in the way of deep sleep. 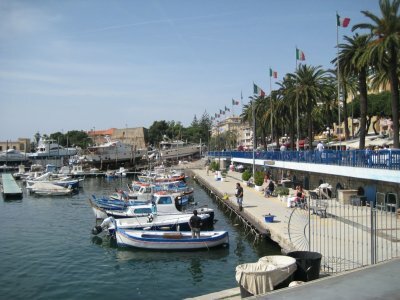 Saturday morning was beautiful and sunny, and after splashing some water on my face went out for a walking tour of San Remo. Given I hadn’t planned anything, though, it was to mostly be a wander without direction, following whatever happened to catch my fancy next. 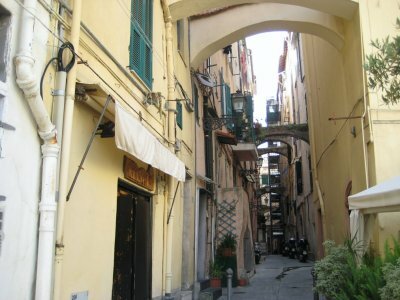 The oldest part of town is Pigna hill, with parts of it dating back to the Medieval times, including the San Siro church. 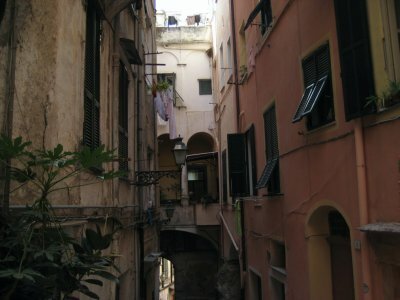 The streets are still narrow and twisting, and there are points when you are walking through them that you actually pass through the medieval walls of the city. 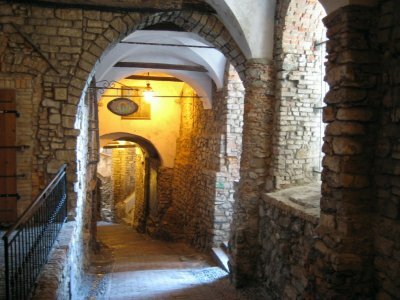 Walking through the twisting and hilly old town, I often felt like this what it must be like being in a Dan Brown novel, where around every corner there is some ancient, 800 year old building holding lord knows what secrets. The only thing missing was some crazed, albino monk chasing me. Like Nice, everyone is on scooters. 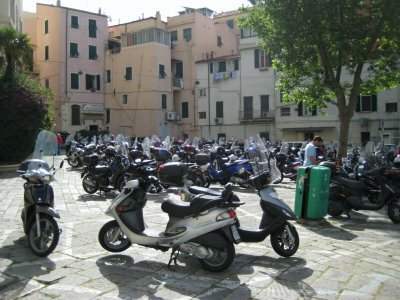 I thought for a moment this was a scooter farm, but it actually is just a parking lot. 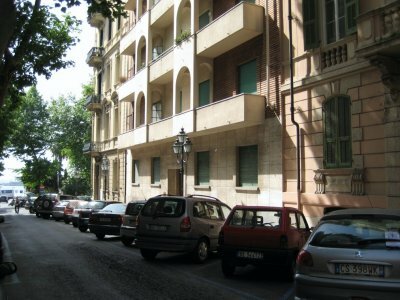 The central of San Remo is a little more modern, but still pretty twisty and older. 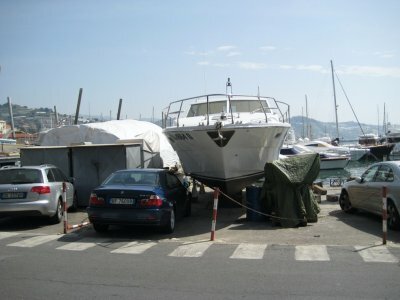 Like most places in the Riviera, they have a fancy Marina full of fancy boats. 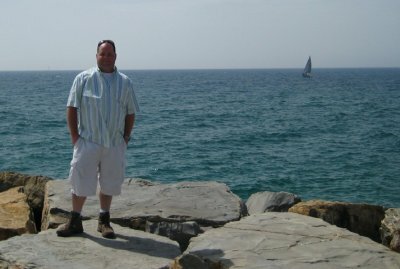 All that walking worked up quite a healthy sweat, and the Mediterranean Sea was calling to me with her cool blue waters. 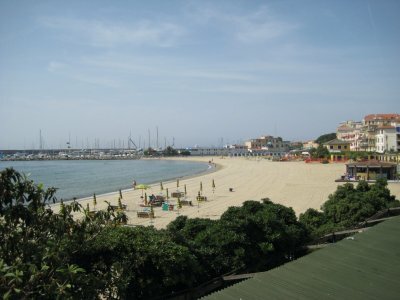 There are a few sand beaches in San Remo, probably man made I would guess. Most of them require some fee to get in. The one beach I found that had free admission was jammed packed, so I decided to splash out in true Monaco-glamour style, and pay to use one of the other beaches. €4 later I had admission to a beach and a blue beach chair in which to sit. On setting up the chair, the beach boy (for you know us big spenders don’t set up our own beach hairs) noticed a moth on the chair. “It’s good luck, to have a moth,” he said. I just figured it would eat the fabric of the chair, and shooed it away. 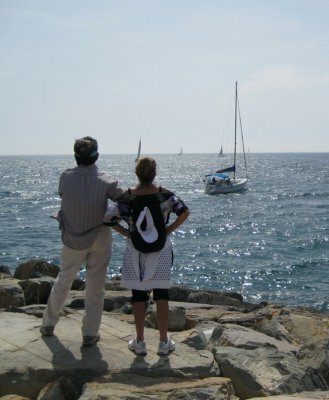 The water of the Mediterranean was more than cool, it was COLD. I shivered as I waded into the water, deeper and deeper until the water started to lap at my upper thighs. Male readers will know this moment, when you know the next step will take the water up between your legs and immerse your groin in the cold water. It is truly a breath taking moment when that happens, and I think most men pause momentarily before taking that next step. But we all must wade onwards. I took that step, and felt the air get sucked out of my lungs. I stood motionless and took three quick breaths in, refilling my lungs after the sucker punch of the cold water. Rebalanced and starting to adjust, I continue to wade into the water, sucker punched again as my chest goes under, and finally one last time when I dive forward and my head feels the cold water’s blast. After adjusting to the cold water, though, it felt nice. The Mediterranean there in San Remo certainly isn’t like the warm water of the Caribbean, where you can soak for hours in a relaxing bath, but after a day of sweaty site-seeing, it was nice to have a quick, cooling dip in the water, and made the sun feel even nicer upon climbing back out and taking my place on my beach chair. As I sat warming myself, the moth returned, landing first on my knee, and then flying up and landing on my right arm. This time, I didn’t shoo him away, instead I let him sat for as long as he wanted, which wasn’t long at all, just a few seconds. “Hopefully enough to pass some luck on to me,” I thought.